JSC/JDC result published yesterday. A huge amount of student grabbed the highest GPA with a very high pass rate. But, some students did not secure their desired results. Those students are not happy with their result or expect better grade, Education Board are arranged re-scrutiny process in that case. Re-scrutiny process only for Teletalk Mobile. After applying through mobile you will get an reply SMS with a PIN number. This message will let you know how much money you have to pay for this application. TK 125/= will be charged from your mobile balance for every subject..
To pay the charge you must have sufficient balance in your mobile account. 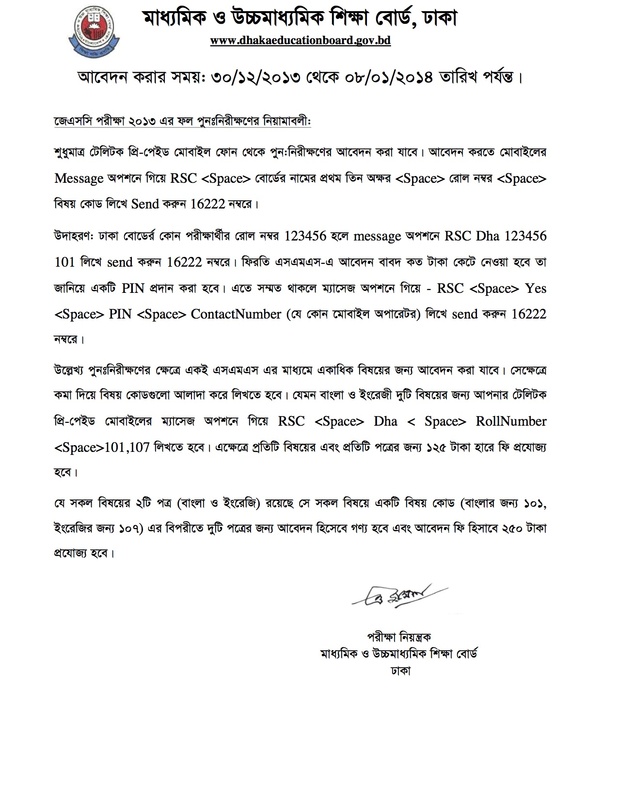 you have to write RSC<space>YES<space>Pin Number<space>Contact number and send to 16222. Another confirmation sms will be sent to your mobile mentioning candidate’s name and track number. Your Re-scrutiny Result will be send to your provided mobile number. How can I get my JDC exam’s marksheet?